No matter how good you are at searching with a transceiver, if you don't have a probe and shovel the victim will probably die—the transceiver leads to the probe, the probe leads to the shovel, and the shovel leads to the victim. During training, it is easy to get so focused on the time that it takes to locate the transmitter that you forget that excavating the victim is the most time-consuming portion of most avalanche rescues . The initial goal of shoveling is to expose the patient's airway and to remove snow from the patient's torso ("brow to belt") so they can breathe. Perhaps the biggest difference among the many quality avalanche shovels is size: both blade surface area and assembled shaft length. Keep in mind that bigger is not necessarily better. When shoveling you'll be down near the snow surface (unlike when shoveling your driveway) and an excessively large bladeful of snow is not an efficient way to move snow. And make sure the disassembled shovel can fit securely into your pack. Check that you can assemble the shovel quickly and reliably with your typical winter handwear. If you frequently wear mittens instead of gloves, you'll want either a D-shaped handle or perhaps an offset-T designs. Blade shape varies considerably. Sculpted, pointy blades are better for rescue and flat blades are preferable for snowpit work. If your backpack has limited space, you might consider a model where the shaft stores in the blade (e.g., the Black Diamond Deploy shovels). Some shovel shafts can accommodate a probe or snow saw (or even emergency sled hardware for the K2 Rescue Shovel Plus), but make sure it's a probe or snow saw that you'd buy regardless of its stow-away convenience. Leave your probe in the snow when it hits the victim. This will keep you on target and reduce the likelihood that you will be standing on the victim (who may be struggling to breathe). Begin digging on the downhill side of the probe at a distance of approximately 1.5 the burial depth (i.e. probe depth). This makes it easier to remove the excavated snow and prevents the shovelers from struggling at the bottom of a cone-shaped hole. Rotate the lead shoveler every minute or two to reduce fatigue. The other shovelers should help by moving the discarded snow further downhill from the hole. There are two basic shoveling strategies. Which one you choose should be based on the number of rescuers available. 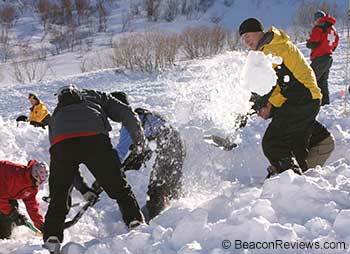 Companion shoveling is appropriate when there are a limited number of rescuers—typically one to four. It moves the most snow with the minimum effort. When you have more resources (i.e., more rescuers, muscle, and calories to burn), conveyor belt shoveling will blast through a large amount of snow rapidly. If the burial depth is one-meter or less, begin digging one-meter downhill of the probe. Starting downhill reduces the likelihood that you'll be standing on the victim and allows you to discard the excavated snow. If the burial depth is more than one meter, begin shoveling downhill of the victim approximately 1.5 times the burial depth. In burials of a meter or more, the snow should be moved to the sides first to preserve the downhill side for snow when the excavation becomes deeper. If you have limited resources (aka rescuers), try to shovel snow only once. If there are two shovelers, shovel side by side. If there are three shovelers, have two shovelers up front and one behind clearing the additional snow. Shovel ergonomically (i.e., use your entire body not just your arms, kneel whenever possible, avoid bending at the waist, don't waste energy throwing the snow further than necessary, etc). Depending on the density of the snow, it is usually faster to "chop and sweep" the snow rather than to "scoop and throw" the snow. If you have plenty of rescuers, the "V-Shaped Conveyor Belt" approach to shoveling (as developed by Manuel Genswein and Ragnhild Eide) can move a large amount of snow in a relatively short amount of time. Click the right-arrow on the following slideshow to move through the six slides. It is important that you practice shoveling—it's the most time-consuming part of a rescue! And at a minimum, you should practice rapidly deploying your shovel every time you practice using your transceiver.